As a kid, I had the wonderful opportunity to go to Disney World twice. Those two trips were the most memorable family vacations I can remember taking. Now, as an adult, I get to give the memory of these wonderful vacations to my own children. As a family, we attend Disney World as often as we can. We usually have our next trip planned by the time we depart on the Magical Express. I am known to my friends as the “Disney Queen” and have helped many of them plan their trips. I am so excited to now have the opportunity to extend my love and knowledge of Disney to you!! As a vacation specialist and a Disney College graduate, I am equipped to plan the perfect trip. I will make it my top priority to work within your budget, plan your must do’s, take the stress out of planning and make it my mission to plan a magical trip you and your family will never forget and talk about for years to come. Make sure to put JODIE in the agent request box! Planning a Disney World vacation can be very overwhelming, but working with Jodie Gammon from Magical Vacations was one of the best decisions we have made. 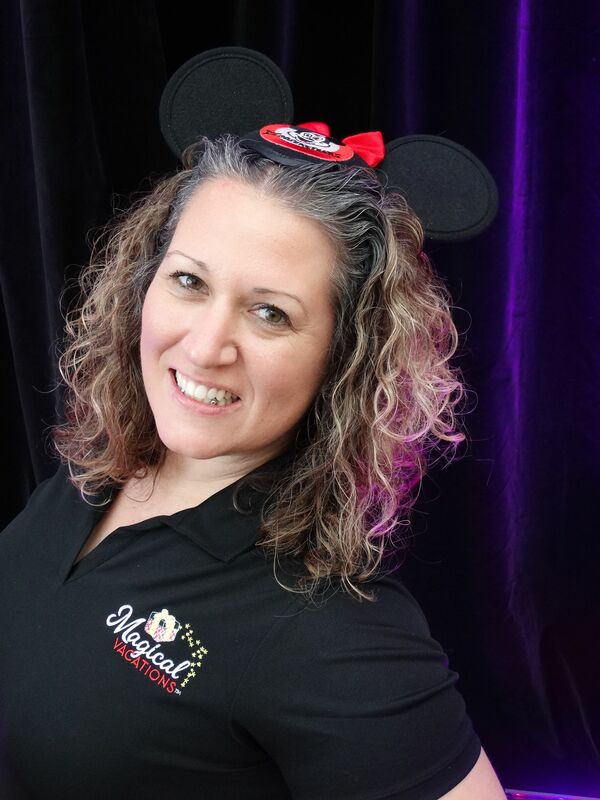 From the very beginning, Jodie was very organized, helpful and most knowledgeable regarding Disney information. Jodie walked us through the process beginning with choosing the Disney Resort, planning the activities and presenting us with many tips and insights that allowed our vacation to be a most memorable time. Jodie takes a personal interest in ensuring that the vacation is first class from beginning to the end. Happy New Year! We have just returned from an amazing trip to Disney World. We had the privilege of working with your agent, Jodie Gammon. Jodie expertly had our trip planned from the moment we left the house until our return home. No detail was too small to address and all the bases were covered. Our fast passes and all dining arrangements were secured ahead. She really listened to us, and, took into consideration our likes and dislikes when making suggestions for our activities. Her suggestions turned out to be right on target. Jodie is remarkable at planning out a very doable schedule. She even mapped out each park with regard to time and distance for each ride and or show to make it as convenient for us as possible. Jodie also gave s many great helpful tips and ideas to eliminate problems we would not have been able to predict. Working with Jodie was a most enjoyable experience. She was completely professional and yet the atmosphere was very friendly and comfortable. Thank you for providing us with your service. Joyce and Mike C.
My family and I just recently returned from a wonderful vacation to Disney World. The last time we went, I planned the whole thing myself. I did not enjoy the planning process and felt very stressed about planning everything just right. This time we were very lucky to have Jodie G. plan our trip for us. She took all of the stress out of planning this trip. She is extremely knowledgeable about all of the parks, rides, restaurants and transportation. Although she planned the trip, Jodie always kept me informed. She asked lots of questions about what kinds of food and rides my family likes so she could pick just the right restaurants and fast passes. Once we got to Disney, all we had to do was follow the agenda that was given to us and enjoy ourselves. Jodie truly helped make this a magical trip for my family! Thank you, Jodie!! We would like to thank Jodie for making our Disney vacation truly Magical! Her help with planning, advice and direction made our first Disney vacation a special time we will always remember. Jodie's inside knowledge and passion for everything Disney guided us through every step of our trip and kept us excited as we approached our travel date. Working with Jodie was fun and her excitement was contagious! The planning process went smoothly as she kept us up to date while leading us through dining reservations, fast-passes and character meets. We felt comfortable turning over our plans to Jodie and she didn’t disappoint! Having Jodie available behind the scenes even during our trip was like having a personal concierge. Her availability made it easier for us to enjoy our time at the parks. Even a last minute request during our stay to make sure we didn’t miss out on Test Track was met with the same energy and excitement we came to expect from Jodie. We have told friends and family about Jodie and recommend they work with her for any upcoming Disney trips. Thanks Jodie for the Magical memories! Let me please take some time to brag upon how magical of an experience we had with your representative Jodie Gammon! It came highly recommended to us to use your company to plan our Disney World vacation, and I couldn’t be happier that I listened to that recommendation! Magical Vacations designated Jodie Gammon to take care of us, and from the very first encounter, and all the way through our vacation, she was nothing short of amazing! My family and I had never planned a Disney World vacation ourselves, although we had both gone on a Disney vacation in which someone else had planned. We were green in our knowledge from where to stay, where to eat and what we wanted to do! Jodie was a wealth of knowledge in all of these categories! She was able to quickly narrow down a place that could accommodate our needs and budget. From there she took notes on our interests based on our kids ages and made all kinds of suggestions and thoughts on how we could get the most out of our vacation. I can’t tell you how many hours I spent talking to Jodie on the phone as she diligently and patiently explained everything from dining plans, to fast pass options, to bibbity bobby boutique and the pirate league cruise! The excitement in her voice made me know she is truly passionate about her job and is as excited as you are to be going to Disney World! As our vacation neared, our magic bands had arrived, and our Minnie Box with our itinerary was sifted through, we had one final conversation with Jodie prior to leaving. Jodie made sure that we understood everything down to how to navigate the airport in the middle of the night when our flight arrived to get to the magical express. Let our vacation begin! I kinda felt like she was going with us too! .... We were so pleased with the care and service provided by Jodie Gammon. Please use this letter to let others know how highly recommended she is! We look forward to planning our next Disney World vacation with Jodie! Terrific! Amazing! Fantastic! Stupendous! Wonderful! Magician! All these words together still don't capture what an amazing person Jodie G. is! The number one To-Do on your vacation planning list should be contacting Jodie! Your vacation will truly begin the moment you speak with her. She is an absolute joy to work with! By sharing your dreams, desires, & the necessities of your trip, Jodie helps clarify your perfect vacation! Once she knows what you're looking for, she's a bulldog going after reservations, fast passes & plans, just to get you exactly what you want. She has a wealth of knowledge that she gladly shares. She was available to us during the planning stage as well as while we were on our trip. Our pre-vacation meeting was so special!! My daughter was so excited to get the famous Minnie box with all the specialized goodies inside!! The thoughtfulness of the gifts added to the specialness of our trip. The vacation resource/itinerary book was an invaluable resource. I give Jodie my absolute highest recommendation! I would recommend her to anyone planning a Disney vacation; in fact, I think it would be simply ridiculous not to use her! Entrust Jodie with your vacation-you'll forever be glad you did! !